A number of Bedouin communities east of Jerusalem were raided by Israeli forces,on Thursday, just days after residents were served demolition and evacuation orders. Popular committee spokesman Hani Halabiya told Ma'an News Agency that dozens of soldiers entered the Khillet al-Qamar area in Abu Dis, escorted by a bulldozer, as a military plane circled above. 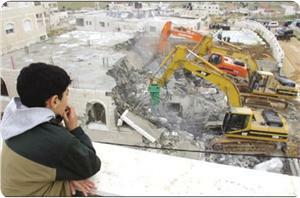 The bulldozer then proceeded to demolish walls surrounding homes and lands in the area without warning. Mr. Halabiya stated that the demolitions were part of a larger Israeli plan to displace some 14,000 Bedouins living in nearly two dozen communities across the West Bank. Ma'an reports that, over the past week, Palestinian agriculture and foreign affairs ministers, in additiona to 42 local and international organizations, including Israeli, have condemned the plans, which aim to relocate the Beoduins into two towns. The move is said to be directed at clearing thousands of acres of lands for the construction of more Jewish-only settlements in the West Bank, with special focus on the E1 corridor which cuts across the heart of the West Bank, between Jerusalem and Jericho. Israeli authorities have denied that the plans are a covert attempt at the forcible transfer of Palestinian Bedouins but, rather, intend to improve quality of life for some of the 90,000 Bedouin Israeli citizens. Palestinians in Israel, however, have witnessed similiar moves against their communities, according to Ma'an. 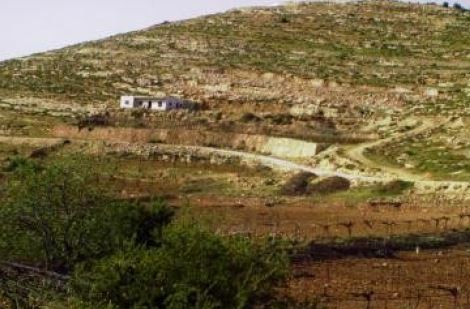 A number of extremist Israeli settlers bulldozed agricultural, and grazing, lands belonging to residents from Deir Estia and Hares villages, north of the Central West Bank city of Salfit. 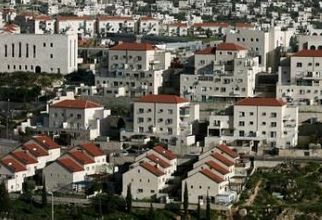 The settlers came from the Revava illegal Israeli settlement, built on Palestinian lands in the district. The attack is part of Israel’s efforts to expand the illegal settlements on the expense of Palestinian lands belonging to residents of Deir Estia and Hares. Khaled Ma’ali, a researcher specialized in settlement affairs, said the uprooted agricultural and herding lands have recently been illegally confiscated from the Palestinians by an Israeli military order, under different “justifications”. He said Israel has already confiscated around 100 Dunams (24.7 Acres) of Palestinian lands in the eastern areas of Hares town. Ma’ali added that Israel has been bulldozing Palestinian lands in various areas in the Salfit District in order to expand its illegitimate settlements, an issue that increased the suffering of the residents, and deprived them of their livelihoods. The Yesha Council of Settlements has reported that the number of Jewish settlers living in the occupied West Bank, including in and around occupied Jerusalem, has reached 382031, adding that 7500 Israelis have moved into West Bank and Jerusalem settlements in the last six months. Yesha said that, back in January of 2014, 374469 settlers lived in the West Bank and Jerusalem, and that the current number of settlers (382031) is a 2% increase. It said that the biggest settlement is Beitar Illit settlement, located southwest of occupied Jerusalem, with a population of 63087 Jewish settlers. There are more than 200.000 Israeli settlers living in various settlements in occupied East Jerusalem. 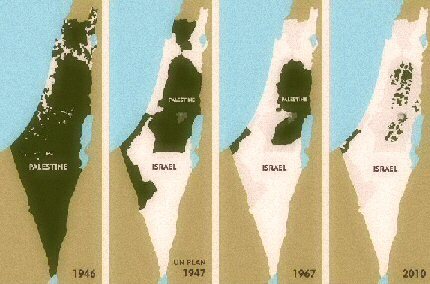 Settlements are illegal under International Law and the Fourth Geneva Convention, to which Israel is a signatory. They are largely built on privately-owned Palestinian lands, and many on what Israel calls “State Lands” which, by itself, is illegal as the West Bank and Jerusalem are under illegitimate Israeli occupation. Israel’s settlements and its Annexation Wall continue to cause Palestinians to lose more of their lands and orchards, while vast areas of lands and orchards are now completely isolated behind the Wall. On July 9, 2004, the International Court at The Hague issued an advisory ruling stating that the Wall Israel is building in the occupied territories is illegal and must be dismantled. The court also ruled that Palestinians affected by the construction of this Wall must be compensated. Israeli ignored the ruling. On July 21, 2004, the UN General Assembly voted today to support the July 9 ruling by the International Court. Israel claims that the wall meant to protect it from attackers, especially suicide bombers, but facts on the ground show that the illegal Wall is built deep inside the occupied territories, separating Palestinian villages from their surroundings and even separating the villagers from their lands. The Wall is also built far away from the Green Line that separates ‘Israel’ from the West Bank, and is designed to enable further construction and expansion of Jewish-only settlements in occupied Palestine. Israel is planning to forcibly transfer thousands of Palestinian Bedouins from their West Bank communities into a designated township to free up land for settlement expansion. Local and international groups are urging world leaders to pressure Israel to stop this violation of Palestinian rights. The Israeli government publicized, last week, six plans to move Palestinian Bedouins out of their communities around Jericho, Ramallah, and Jerusalem. The plans include moving Bedouins out of the politically sensitive area referred to as the Jerusalem Periphery or “E1,” where Israel has long-intended to demolish 23 Bedouin villages in order to expand and link settlements. Settlement expansion in this area would cut the West Bank in two, further disrupting movement and social and economic ties between major Palestinian cities and limiting the little access Palestinians in the West Bank have to Jerusalem. All of the Palestinian Bedouin communities slated for transfer are located in Area C, the 60 percent of the West Bank where Israel maintains full civil and military control. There are already around 341,000 Israeli settlers living in more than 100 settlements throughout Area C. Although Area C is within the internationally recognized 1967 borders of the occupied Palestinian territory, Israel only allows Palestinians to build on 1 percent of it. International humanitarian organisations have noted that this lack of authority to build makes Palestinians vulnerable to home demolition, displacement, and forcible transfer and limits their ability to realize their rights to water, to adequate shelter, to education, health, and to livelihood. Over 40 local and international agencies have called on world leaders to pressure Israel to cancel these plans. In recent months, the government of Israel has used coercive tactics to heighten the pressure on Palestinian Bedouin communities, issuing eviction orders and demolishing homes and livelihood structures. Aid agencies report that Israel has also obstructed them from delivering assistance to these communities, including by seizing and destroying emergency shelters that international donors provided for families whose homes were demolished and confiscating a swing-set and a slide for a Bedouin school. The UN Office for the Coordination of Humanitarian Affairs (UNOCHA) reports that Israel has already demolished more than 350 Palestinian homes or livelihood structures in Area C in 2014, while demolitions in the Jerusalem periphery and E1 area have hit a five-year high, displacing 170 Bedouins, 91 of whom are children. 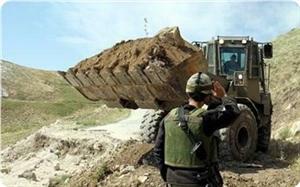 Israeli occupation forces (IOF) escorted huge bulldozers into Kifl Hares, south west of Salfit province, on Saturday morning and leveled land. Eyewitnesses said that the bulldozers razed olive trees to pave the way for expanding a power station supplying Jewish settlements in Salfit with electricity. 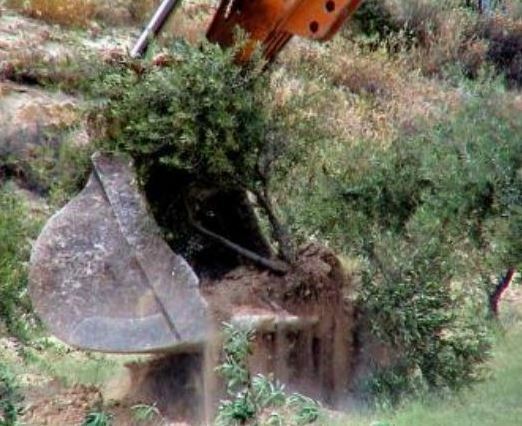 They said that the bulldozers broke and destroyed olive trees during their work, adding that the Israeli attempt to appropriate and annex more Palestinian land in the province never ceased. 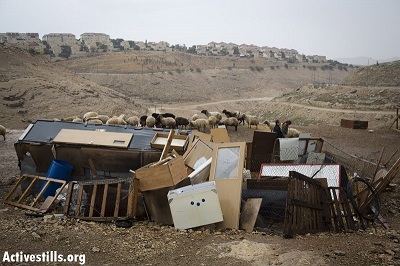 42 Palestinian, Israeli, and international organizations are urgently calling on world leaders to stop Israeli plans to forcibly transfer thousands of Palestinian Bedouins out of their communities in the central part of the occupied West Bank and into a designated township. The organizations stressed that the international community must take all possible measures to ensure that individual and mass forcible transfer, which is a grave breach of the Fourth Geneva Convention, does not take place. The organizations said world leaders should immediately press Israel to cancel all transfer plans and allow Palestinians to remain in and develop their communities, warning that the transfer of Palestinian Bedouins from their current locations would free up land for Israeli settlement expansion in a way that could render the two-state solution unachievable. The call comes as the Israeli government publicized this week six plans to move Palestinian Bedouins out of their communities around Jericho, Ramallah, and Jerusalem. The plans include moving Bedouins out of the politically sensitive area referred to as the Jerusalem Periphery or “E1,” where Israel has long-intended to demolish 23 Bedouin villages in order to expand and link settlements, established in violation of international law. Settlement expansion in this area would cut the West Bank in two, further disrupting movement and social and economic ties between major Palestinian cities and limiting the little access Palestinians in the West Bank have to Jerusalem. All of the Palestinian Bedouin communities slated for transfer are located in Area C, the 60 percent of the West Bank where Israel maintains full civil and military control. There are already around 341,000 Israeli settlers living in more than 100 settlements throughout Area C. Although Area C is within the internationally recognized 1967 borders of the occupied Palestinian territory, Israel only allows Palestinians to build on 1 percent of it. The lack of authority to build makes Palestinians vulnerable to home demolition, displacement, and forcible transfer and limits their ability to realize their rights to water, to adequate shelter, to education, health, and to livelihood. In recent months, the government of Israel has used coercive tactics to heighten the pressure on Palestinian Bedouin communities, issuing eviction orders and demolishing homes and livelihood structures. Israel has also obstructed aid agencies from delivering assistance to these communities, including by seizing and destroying emergency shelters that international donors provided for families whose homes were demolished and confiscating a swing-set and a slide for a Bedouin school. Israel has already demolished more than 350 Palestinian homes or livelihood structures in Area C in 2014, while demolitions in the Jerusalem periphery and E1 area have hit a five-year high, displacing 170 Bedouins, 91 of whom are children. “Being in constant danger of forcible transfer is not a healthy way of living. We are scared, we can’t build, we lack basic rights, but we don’t want to move to a township. If you ask me to move I would say no. I was born as a Bedouin, and we want to preserve our traditions. Israel is claiming they will create a better solution for us, I will tell you that’s not true, that transferring us will destroy our lifestyle and traditions. If they really want to create a better solution they can let us to go back to the Negev or stay where we are and receive services,” said Jameel Hamadeen, a 32-year-old resident of Sateh al Bahr, one of the Bedouin communities slated for demolition and transfer. Under the guise of protecting freedom of religion, Israel seeks to entrench its occupation in East Jerusalem's Mount of Olives. The Knesset's powerful Internal Affairs Committee will conduct a special tour of the Mount of Olives cemetery in occupied East Jerusalem Thursday, ostensibly to examine on-site "security arrangements" for visitors and preservation of the cemetery. Under the guise of ensuring access and freedom of worship in the Jewish cemetery, which has also become a pilgrimage site for numerous Christians, these arrangements are part of the Israeli campaign to entrench its occupation in East Jerusalem. Led by committee chairperson MK Miri Regev (Likud), the tour will include committee members, police officials and representatives of the International Committee for the Protection of the Mount of Olives in Israel, Jeff Daube and Harvey Schwartz. Following the tour, the Knesset committee members will meet with police officials and members of the International Committee to draw conclusions and render operational any new security arrangements decided upon. Daube told the Jerusalem Post in June this year that "'plans are underway to construct a visitor and education facility on the site, with the help of a NIS 10 million government allocation'. Meanwhile, Schwartz emphasized the import of the site with respect to Jewish history". “We don’t just want to ensure security, but to also enhance the mountain to make it the educational center for Jewish history and Zionism,” said Daube. Following Lindenstrauss' report, the Israeli government committed itself to restoring 20,000 of the 150,000 graves on the Mount of Olives, and installing security cameras throughout the site. A police sub-station was also established adjacent to the cemetery, and there exists general agreement that vandalism of the gravestones and rock throwing have subsequently decreased. 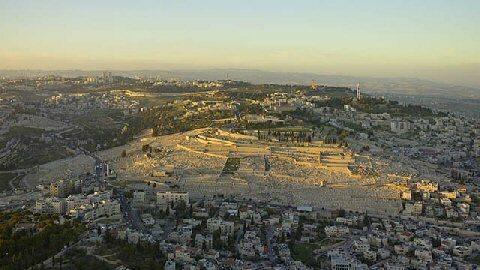 However, in addition to monitoring conditions and repairing physical damage in the Mount of Olives cemetery, the international committee aims to "educate Jews and non-Jews about the sanctity and relevance of Har Hazeitim (Mount of Olives in Hebrew - AIC) to the Jewish people". The committee is proud of its access to high-ranking Israeli politicians, including "Israeli Prime Minister Benjamin Netanyahu, Jerusalem Mayor Nir Barkat, Cabinet Ministers, Members of Knesset and prominent Israelis and Americans. It conducted a tour of the area in June for then Deputy Defence Minister Danny Danon. The Jerusalem Post quotes Danon as saying during this tour that "any framework for peace negotiations would need to take into account that the cemetery would obviously remain in Israeli hands under any possible agreement". Employing familiar Zionist imagery of Jews making the empty land of Israel bloom, Arutz 7 quotes David Martin, lawyer for the committee: “It is not by chance that Jerusalem is the border post between the settled, arable area that extends to the Mediterranean coast and on the other side, the desert. Jerusalem cries out ‘What will the Land of Israel be? Will it be settled, or a desert?’ When the land is in our hands, it will be settled, it will be arable, it will be fertile,” Martin said. ”But when it is in the hands of others, it will be a desert"
Israeli authorities confirmed confiscation of 2,000 dunams of Palestinian-owned land in the West Bank's South Hebron Hills area. PA: Confiscation constitutes "new stab" by Israel on efforts to achieve peace and the two-state solution. Israeli authorities confirmed confiscation of 2,000 dunams of Palestinian-owned land in the West Bank's South Hebron Hills area. The confiscation order, originally issued in 1997, was confirmed this weekend by Israeli officials who refused requests by Palestinians to build on their privately-owned land, located in the Ibe Zaid Valley near the village of Aldairat. The original confiscation order noted that the land was taken for "military purposes". The confiscated land, however, has yet to be altered by the Israeli army and is located to the west of the settlement of Karmel, which has been expanding in the past year. 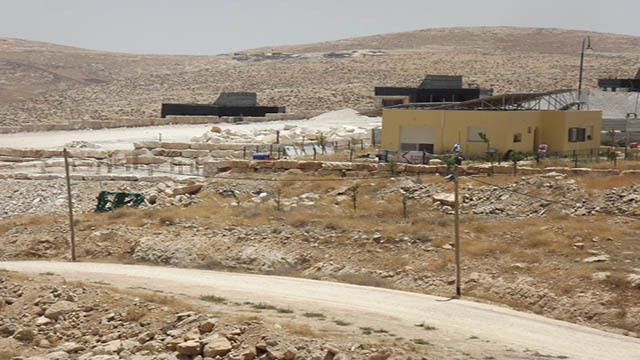 Rateb Jbour, coordinator of the South Hebron Hills popular committees, told the AIC that Israel is using the order to "displace residents" and that the confiscated land is planted with olive trees and is also cultivated during the winter with seasonal crops such as wheat. Jbour said that Israeli authorities issued the original confiscation orders in 1997 and accused authorities of attempting to "displace residents." Jbour told the Palestinian news agency Ma'an that the confiscated lands are privately owned by the al-Hamamdeh, Abu Aram, al-Naamin, al-Jabbarin, and Muhammad families, who have begun legal action against the orders. Confirmation of this confiscation order comes just days after Israel announced confiscation of 4,000 dunams of land in the Gush Etzion settlement bloc, the largest such land grab in thirty years. Last week Israel further announced expropriation of 12 dunams of land in the Hebron-area village of Seir for unexplained "military reasons". Not coincidentally, the land slated for expropriation is located adjacent to the settlement of Asfar (Metzad). The Palestinian Authority has strongly condemned the Israeli confiscation in Deirat, saying “The plunder of Palestinian land constitutes a new stab administered by Israel, the Occupying Power, on international law, international legitimacy resolutions, the will of the international community, and on all efforts aimed to achieve peace and advance the two-state solution”. Palestinian Presidential Spokesperson Nabil Abu Rudeineh also slammed srael’s decision to seize 2,000 dunums of privately-owned Palestinian land in this area, saying “As long as Israel announces further orders to seize [Palestinian-owned] land in the [occupied] West Bank, it is destroying everything, making it inevitable for us to seek to convene the UN Security Council and accede to international organizations with the purpose of protecting the Palestinian land”. Hundreds of Palestinians marched in solidarity across the West Bank, on Friday, in a call for an end to the Israeli occupation and in protest against the continued illegal confiscation of Palestinian land and expansion of Jewish-only settlements. According to Ma'an News Agency, protests took place in the southern West Bank village of Wadi Fukin, near Bethlehem, as well as in Nabi Saleh and Bilin villages, near Ramallah, in the central West Bank. Dozens of Palestinians reportedly suffered the effects of excessive tear gas inhalation in Wadi Fukin after Israeli forces attempted to disperse a march near the village. Demonstrators in attendance protested against a recent Israeli decision to confiscate 4,000 dunams (1,000 acres) of privately-owned Palestinian land, including a large chunk of the village itself, to expand Jewish-only settlements nearby. Protesters began planting olive tree saplings in the eastern part of the village, but were subsequently assaulted by Israeli soldiers, according to Ma'an. If Israel goes ahead with the decision to confiscate these lands, it would be the largest Israeli land grab in the West Bank since the 1980s. Israeli forces also dispersed a weekly march in Nabi Saleh village, in northern Ramallah, with tear gas bombs and rubber-coated bullets, suffocating and injuring many. Dozens of soldiers were reported to have been deployed around the village, earlier in the day, after Israeli forces declared it a "closed security zone". Troops blocked the main road and forced locals to use unpaved, bumpy roads for travelling in and out of the village. Another weekly march against the separation wall and settlements was repressed with similar tactics by Israeli troops in the village of Bilin, in Ramallah. Protesters marched with Palestinian flags, chanting slogans and singing national songs calling for Palestinian unity, resistance against the occupation, the releasing of prisoners, and against the continuous and illegal confiscation of land by Israeli forces and colonial settlers. Ma'an further reports that, since 2005, Bilin villagers have protested on a weekly basis against the Israeli separation wall that runs through their village on land confiscated from local farmers. Previous protests by Bilin activists have forced the Israeli authorities to re-route the wall. However, large portions of village lands remain inaccessible to residents because of the route. Israel began building the segregation wall in 2002, and the route has been targeted with regular demonstrations by residents of border towns whose land is severed by its path. Israeli soldiers invaded, Saturday, the Wad Ben Zeid valley area, northeast of Yatta town and south of the southern West Bank city of Hebron, handing a number of residents military orders informing them of an illegal grab of 2000 Dunams (494.2 Acres) of agricultural lands. Rateb Jabour, coordinator of the Popular Committee against the Wall and Settlements, in southern Hebron, stated the military order was actually issued in 1997, but that the residents were never informed of the decision and, therefore, did not have the chance to challenge it in court. Jabour added that the 2000 Dunams include olive orchards and several homes used by the families in their own lands. The order also states that the homes must be evicted, and likely demolished. 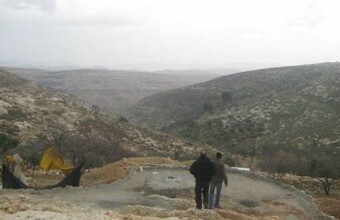 The lands are owned by the families of Na’amin, Jabarin, al-‘Adra, al-Hamamda, Mohammad and Abu ‘Arram. Jabour denounced the illegitimate decision, and said it falls under Israel’s ongoing, illegal settlement construction and expansion activities, mainly targeting villages and towns south of Hebron. “They want to force the families out of their homes and lands," he said. 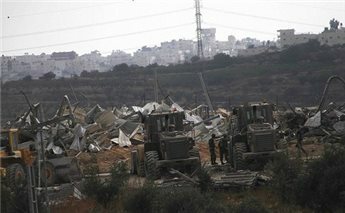 “Those lands are owned by the families, but Israel continues to violate International Law, and continues its theft of Palestinian lands...."
The Israeli occupation bulldozers on Tuesday and Wednesday wrecked loads of Gaza humanitarian aid stuff and Palestinian residential structures in Occupied Jerusalem and the West Bank under fallacious pretexts. According to the structures’ owner in Jerusalem, Haj Abu Nejma, the occupation bulldozers smashed food aid items and relief materials to be delivered to the embattled Gaza Strip via charity and rescue agencies in Occupied Jerusalem. Jerusalem’s municipality has been turning down Abu Nejma’s appeals and applications for construction permits since 1996, under unsound excuses. The occupation bulldozers demolished on Wednesday two residential rooms of Abu Nejma’s, covering an overall area of around 60 m2. The rooms have been the only place where Abu Nejma and his wife have been sheltering and amassing donations for the hundreds of needy and displaced Palestinian families. The Israeli invading troops destroyed another residential home, where Abu Nejma’s sons Tarek and Nadim, along with their five-member family, live. The structure was reduced to rubble by the Israeli occupation forces (IOF) after arresting Tarek. The occupation bulldozers further razed the fences surrounding the land and other corals for raising horses and cattle, along with a number of parked cars. In a similar assault on Tuesday, the IOF destroyed a Palestinian family home and a water well in al-Rama suburb, in the southern West Bank city of al-Khalil, without prior notification. The demolition campaign culminated in the flattening of a dairy factory and al-Rayan farm, owned by the Islamic Charity Organization on the outskirts of al-Khalil. 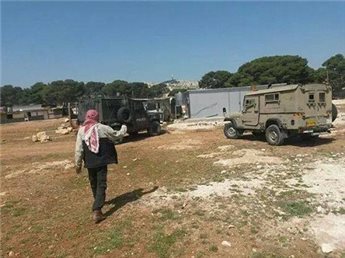 A series of Israeli demolition threats, targeting Palestinian civilian residential tents and homes in Yatta, south of al-Khalil, were arbitrarily issued on Wednesday under pretext that the area was declared a closed military zone. The Israeli occupation authorities have stepped up their arbitrary demolition campaigns targeting family homes and residential structures of ex-prisoners, human rights activists, innocent civilians and even relief institutions, in a round of oppressive moves that do well embody the inherently sadistic nature of the Israeli occupation. Israeli forces demolished a Palestinian-owned house and a water well in Hebron, on Tuesday, according to locals. Landowner Muhammad Nafith al-Herbawi stated that Israeli forces destroyed his house, along with all of his belongings, and additionally destroyed a well and a 100-meter long wall. Israel's coordinator of government activities in the territories (COGAT) told Ma'an News Agency that "security forces carried out the demolition of two buildings which were built without the necessary permits in the Hebron area." A Ma'an reporter said, earlier, that Israeli forces demolished Palestinian homes and structures near Jaba'a village, east of Jerusalem, where bulldozers destroyed five houses, four steel structures, and a barn belonging to Bedouin families. 359 Palestinian structures in the West Bank have been demolished by Israel in 2014 alone, according to the Israeli Committee Against House Demolitions. Some 27,000 Palestinian homes and structures have been destroyed by Israel since it first occupied the West Bank, in 1967. Palestinians are rarely given permits to build or to add on to existing homes, while over 550,000 Israelis live in illegally built settlements across the occupied territories, in contravention of international law. Israeli sources have announced that authorities are planning to confiscate 4,000,000 m² (4,000 dunams/1,000 acres) of Palestinian-owned land near the illegal Gush Etzion settlement area. The area is located 3 km east of the Green Line, near Jaba’a village, and is surrounded by the Gush Etzion bloc and the Apartheid Wall. Sources informed, according to the Palestinian News Network (PNN), that the Israeli government has given the land owners 45 days to submit appeals against the court's decision. Muhammad Ghuneimat, who is mayor of the nearby Palestinian town of Surif, told Ma'an that Israeli forces posted signs in private olive orchards in the area, giving warning that they have been confiscated by the Israeli government. The confiscated fields belong to Palestinians from the towns of Surif, Husan, al-Jabaa and Bethlehem, according to Mr. Ghuneimat. The announcement reportedly comes as a response, by Israeli authorities, to the abduction and killing of three Israeli teens in an area near Gush Etzion, in June. However, no solid evidence has actually ever been presented in backing Israel's official claims regarding the case, with critics pointing to the distinct possibility that Israel either created or simply co-opted the incident as a prelude to initiating their recent military offensive on the Gaza Strip. The Etzion settlements council welcomed the announcement, saying in a statement that it "paves the way for the new city of Gevaot."